Imagine if you can instantly tap into real-time data on your students? Or use blockchain to store student performance? These are a few exciting possibilities we explored at the 2nd Annual Future Learning Collaborative Summit in Denver, CO.
We convened on the eve of EDUCAUSE 2018, building on the opportunity to engage those attending the leading conference for technologists at the intersection of innovation and education. There was much to celebrate: our first anniversary as a community of practice, recognizing insights we have surfaced, kicking off a new chapter in the group’s co-creation journey with SONY, a national public announcement about our groups, and a new name. We transformed a local art gallery into our creative meeting space where we engaged in thoughtful discussions, co-creation roundtables, and heard from our community of practice. Michael Horn shared his perspectives on the paradigm shift from classroom learning to online and blended learning environments, and emphasized the importance of physical learning environments. In this talk, Dr. Butch Herod and Kiyoharu Sassa engaged in a dialogue about they successfully collaborated to develop the Member Experience for faculty at Houston Community College. Direct input and insights from this co-creation process has helped Sony further evolve its technology solutions development. In this panel, a few Collaborative members reflected on their shared experiences co-creating with Sony and participating in this community of practice for the last year. They shared important insights on lessons and learnings from user testing and product development on their respective campuses. You can’t build a product without having the people in the classroom give you the feedback. The intent was to make the product, improve the product based on what the faculty really needs. Sony product designers led presentations on exciting new technologies currently in development at Sony for higher education. We explored AI- and blockchain technologies as well as hardware and software solutions for data capture. These technologies are being designed to help educators spend more time teaching, and less time managing the classroom. Our members responded to these technology presentations by breaking into reflective workshops to build a potential use case that imagined what it would be like if the schools had an opportunity to redesign the technologies presented to have better application to known campus challenges. Final proposed use cases were “pitched” back to the Sony product designers by our members. Check out the pitch presentation by Lev, from Arizona State University. We spent our last session together looking into the future with the visionary support of Allison Salisbury, President of Entangled Studios. In small group roundtables, we explored our aspirations for the upcoming year as the Future Learning Collaborative and discussed key challenges members had identified for the upcoming year. On behalf of Entangled Studios and Sony Electronics, we’d like to thank all of our Collaborative Members for their hard work, commitment and curiosity over the last year. We look forward co-creating in 2019! With support from Sony Electronics, the Collaborative facilitates dialogue among practitioners from 11 colleges and universities, and Sony designers and researchers -- to share insights, surface best practices, and source perspectives that reflect the realities, challenges, and opportunities of education technology. Learn more at futurelearningcollaborative.com. What defines a holistic approach to scaling active learning on our campuses? How do you involve and engage faculty in the design process? What smart technologies work best in the classroom? These were a few of the many questions we explored at this summer’s Indiana University Immersion. Sony Collaborative Immersions are events co-hosted with Sony at our member campuses to showcase each school's advances in active learning pedagogy, technology, and research. These events are an opportunity to share insights and to iterate around these shared learnings as a community of practice. This most recent event took us to Indiana University-Bloomington, from July 30 through August 2, 2018, for a three-day learning excursion. Indiana University-Bloomington is one of nine campuses of IU’s major public university system. Forty-six thousand students alone are enrolled on the IU-Bloomington campus. Our gracious Immersion hosts, The Indiana University Information Technology Services team (UITS) manages more than 900 classrooms for 110,000 students. An impressive feat! Led by Julie Johnston, UITS is committed to creating optimal learning environments for both faculty and students. Everything the team touches is intentional by design with the goal to drive effective faculty engagement in the co-design of classrooms. The first day of the Immersion kicked off with a tour of IU’s Data Center and their Media Digitization and Prioritization Initiative. A cocktail reception and dinner followed at the Cyberinfrastructure Building where the University Information Technology Services team mostly resides. 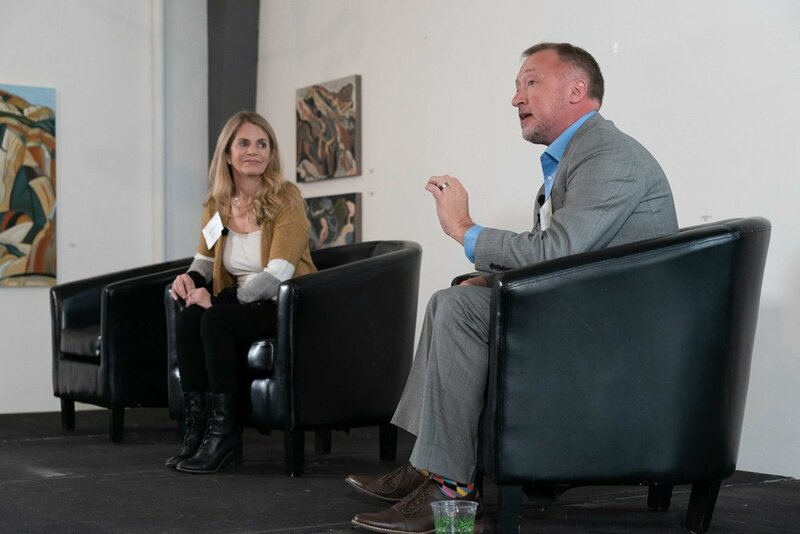 Brad Wheeler, Chief Information Officer and Vice President of Communications and Marketing at Indiana University, welcomed the Collaborative members with an anecdote from his early days of teaching and learning. Brad pioneered the need for active classroom technology in IU’s classrooms, and is now a leader and champion for active learning projects on campus. Stacy Marrone, Associate Provost of Learning Technologies at Indiana University, teed up the day with a warm welcome to the campus in one of IU’s most innovative classrooms: a historic space that was once a woman’s pool house built in 1906, recently converted into a collaborative learning space that fits 96 students. A roundtable discussion with the six Mosaic Fellows from the Mosaic Active Learning Initiative—a group of 76 IU faculty members who’ve created a faculty community to develop, investigate, and design evidence-based active learning practices, principles, and the classrooms that support these strategies on campus. The Mosaic Fellows are designing and preparing others to teach in IU’s range of active learning classrooms. This Fellowship is led by Tracy Birdwell, Principle Instructional Technology Consultant, Mosaic Initiative. A Mosaic design symposium where we brainstormed while in groups in an active learning classroom—a collaborative exercise in creativity, empathy, and visioning. We replicated a design session the Mosaic Active Learning Initiative executed with input from staff, students, and faculty in order to explore the classroom of the future on IU’s campus. A tour of campus lead by Julie Johnston, Director of Learning Spaces at IU, including Franklin Hall, the IU Media School; Teter Hall, examples of non-traditional active learning spaces; and the School of Informatics’ Learning Community. A tour of Upland Brewery, a local wood-aged sour ale brewery, and community dinner at Samira, a family-owned Afghani restaurant. On our final day, we shifted focus to our other member schools to hear their reflections and relative personal experiences. Three of our members led lightning talks on what innovation and student engagement looks like on their own campuses, including Kim Westemeier and Katie Kassof of American University; Emily Isaacs of Montclair State University; and Julie Donnelly of the University of Central Florida. The sessions concluded with a final hands-on design challenge led by Patrice Torcivia Prusko of Entangled Studios, and an overview of the Active Learning Lifecycle Mapping Initiative by Don Merritt of the University of Central Florida. Relationship and collaboration are key to creating a successfully holistic active learning initiative. Invite multiple disciplines, faculty and students to co-create with you. Active learning initiatives can be vehicles to change the perception of faculty professional development. Faculty experience should be woven into an iterative design process that informs evidence-based learning space design. On behalf of the Sony Collaborative, we would like to extend a huge thank you to the UITS team, especially Stacy Morrone, Julie Johnson, Ivana Park, and Karen Garrett for their hands-on support and hospitality. P.S. Don’t forget to RSVP for 2nd Annual Next Generation Learning Summit at EDUCAUSE 2018! Come celebrate our first year as a community of practice. Together, we’ll be gathering at SPACE Gallery to share insights, discuss highlights, and toast to an inaugural year of innovation and collaboration! Register your spot today. “One of the things that’s exciting for us, not just at UCF but nationwide: there’s a lot more focused concern about active learning. And when you look at a lot of the technologies that can support [active learning], it falls right into our laps to be creative, to be innovative,” shares Don Merritt, Director of Instructional Services, Division of Digital Learning at University of Central Florida. His enthusiasm for the rising trend in active learning technologies was shared by many of the Sony Collaborative Member schools who joined us for exclusive partner activities at at InfoComm 2018 in Las Vegas, NV. InfoComm, one of North America’s largest pro-AV conferences, served as the perfect setting for productive discussions around technology, innovation, collaboration, and student success. Sony invited Collaborative schools to participate in activities designed to introduce representatives old and new to the latest higher education technologies from Sony, share members’ own progress in their own campus active learning initiatives, and mingle with fellow schools. The event extravaganza kicked-off with a Sony Partner BBQ and networking reception on the first evening of June 5, 2018. The next morning, Sony provided members with private booth and technology demo tours curated specifically to showcase active learning technologies for our Higher Education members. Our final event for the Sony Collaborative InfoComm Meet-Up was later that hot Vegas afternoon and an opportunity to catch-up with fellow Collaborative schools while sharing stories of their experience co-creating new products and developing ideas to promote next generation learning with Sony. Satoshi Kanemura, Senior General Manager of Sony Imaging Products & Solutions, who kicked us off with inspiring words on the importance of our work, collaboration, and coordination to develop and deliver products that propel student engagement and learning. Hiroshi Kawano, President, Professional Solutions & Services Group of Sony Imaging Products & Solution, who emphasized the impact the Collaborative’s input, feedback, and insights inform Sony’s R&D and active learning developments. New to his role, Mr. Kawano is eager to continue exploring ways we can deepen the Collaborative’s collaboration with Sony and propel student success in the college classroom. Kiyo Sassa, General Manager of Sony B2B of America, showcased discussion capture technology from user feedback sessions at several of our campuses. These product workshops with students and teachers are key to demonstrating how the iterative feedback process is integral to the Collaborative’s work. Grace Gardner, Collaborative Community Manager from Entangled Studios, highlighted insights from FA2 and the need to identify the right metrics and data to measure and scale active learning on campuses across the country. Brian J. Beatty, Associate Vice President, Academic Affairs Operations of San Francisco State University, discussed how his Focus Area 1 team is using Faculty surveys to inform decisions, identify trends, and gather insights across the landscape of our campuses. Deb Whitten, Assistant Vice President for IT Customer Service, Arizona State University, shared insights and successes from her team’s efforts to build the classroom of the future in partnership with the Sony Team. With the support of the Collaborative, the ASU team plans to implement a new Sandbox Faculty Training space in the fall of 2018. This was a double-header meet-up. Day 1 we visited our friends and fellow members at UC San Diego for a Collaborative-curated overview of their campus Active Learning Environments and a presentation from Gabriele Wienhausen, Ph.D., Teaching and Learning Commons Director. Day 2 was a trip to Sony San Diego Office for a comprehensive tour of their campus, several presentations of their leading edge technologies, and a Collaborative catch-up session for our Workshop group. Special thanks to our partners at UC San Diego for hosting us! Our members attending the ELI conference in New Orleans reconvened post-kickoff for a hybrid working session over lunch to review proposals for our first group initiatives. Minutes from our ELI Working Session. Where it all began. Our inaugural meeting was a chance for our members to meet for the first time, talk about their own personal goals and motivations for joining the Collaborative, and to explore the Sony's new next generation learning technologies. Special thanks to all of our members for a great turnout and to our keynote speakers, Bridget Burns from the University Innovation Alliance and Marcelo Worsley, Assistant Professor of Learning Sciences and Computer Science at Northwestern University.